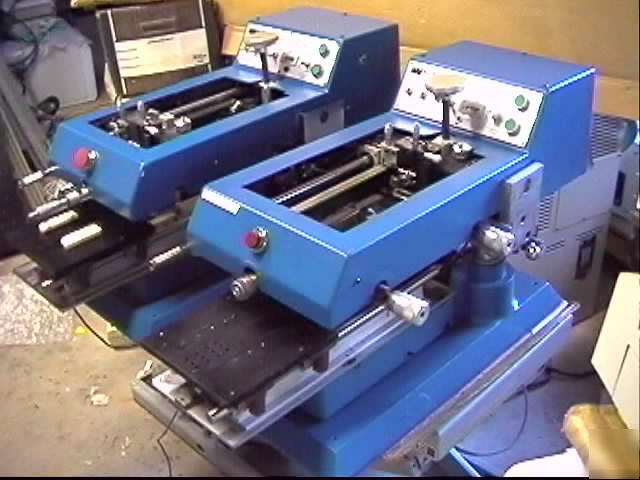 Weltek Model 68AT Precision Screen Printer with supplies. Let us know if you need better images or more detail. Cycle counter is electronic digital. Each unit has a number of precision micrometer type adjustment slide assemblies and at least one or two readouts. One on left is digital micrometer. Spare screens and parts included as shown in images below. We can't find the manuals at present. The screens are machined aluminum frames about 6.6 outside and 5.125" inside square. The fine mesh metal screeen is drawn literally drum tight. Might be just what you need for your circuit board or other precision screen printing application. Condition looks very good used-ready to be put to work. Lots of nice precision motion parts. Sold as-is. What you see is what you get. We are in the Desert Southwest so items may need dusting/cleaning when they arrive.